Low inventory levels (such as those shown on the above chart) suggest strong future GDP growth is in order, as production must be increased to return inventory levels to those commensurate with sales. However, a few caveats are in order. It's important to note that inventory data takes a while to tabulate. As such, this data is already a few months old. 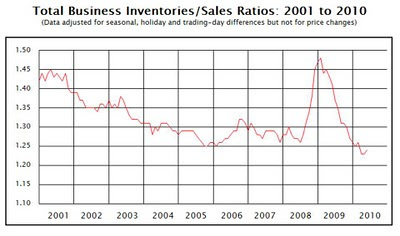 Considering how quickly this chart can change (consider the speed at which the inventory to sales ratio both rose and fell in 2008 and 2009 respectively), we may be looking at stale data. Furthermore, sales levels can also affect the above chart. If sales levels continue to falls, the inventory-to-sales ratio will rise without the need for further production, which suggests a weaker economic outlook. Amidst these contradictory signs, what is the investor to do? Since macroeconomic variables are extremely difficult to interpret, the investor is well-advised to stick to buying easy-to-understand companies trading at discounts to their intrinsic values.